Our preference on safari is luxury tented camps. Our safaris offer first class accommodations, fantastic food, full bar and most importantly the ultimate animal experience. We are in remote locations as far away from other travelers as possible. Our personal choice for your African safari is the intimate "old Africa" feel of tented camps. These small tented camps typically have 6 to 8 luxury tents with en suite bathrooms facilities including toilet, sink and hot showers. Our meals are in beautifully appointed dining tents. The fabulous staff at each camp attends to our every need. At the end of the day we retire to the fireside to gaze at the brilliant stars of the African sky and reflect upon the days adventures. The first and last night of the trip are in beautiful intimate lodges in Arusha. Out in the bush, we prefer either permanent tented camps which are sited where the action is year-round, seasonal tented camps that move with the migration and the seasons, or private mobile tented camps that set up exactly where we want them. 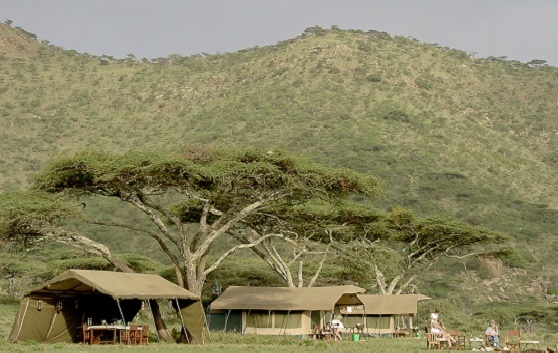 There is always the option of using the big lodges and hotels for your safari. These are typically less expensive than tented camps, although some are much more expensive and extremely luxurious. All are situated nicely and have great views.